The Cordelia Maternity Camisole is a simple, strappy knit top that looks great made in prints as well as solid fabrics. 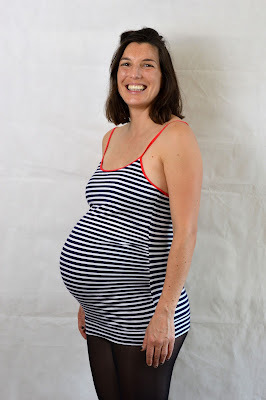 It has been designed for wearing during the third-trimester, which is often a tricky time to dress for as most of your 'regular' clothes probably no longer fit. It has a bump-friendly gathered mid-section, comfortable stretch hem band, and an optional bust support panel. Wear your Cordelia camisole at pregnancy yoga, to sleep in, on its own in warmer months or as a useful layer in cooler parts of the year. It is a great pattern for sewers of almost all experience levels and requires just 90cm of knit fabric (minimum width 115cm/45"). It is advised that you have a couple of completed garment projects under your belt before you give this a try, but extra tips have been included in the instructions for those who are new to working with both knit fabrics and fold over elastic (which is used to finish the top edges and form the straps). For those who are more experienced with sewing knit garments, or after making your first Cordelia camisole, you may prefer to use the single-page condensed version of the instructions which can be found at the end of instructions document. 19-page instruction document with full information including colour photographs illustrating the step-by-step construction method PLUS a single-page condensed version of the instructions. The instructions can be printed out or followed from your computer/tablet screen to save paper and ink. Once you have completed the payment transaction, you will automatically be sent an email including a link. The email may take a couple of minutes to appear in your inbox. 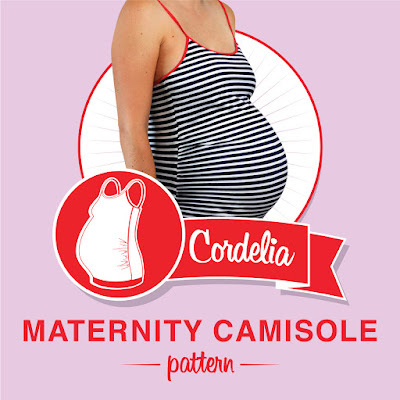 Click on this link to download your Cordelia Maternity Camisole pattern files. You will have three attempts to download the files before the link expires. If you run into difficulty, please email me at sozoblog (at) gmail (dot) com. Me-Made-May 2019: Sign Up Here!! !